The P Smart is not a high-end flagship smartphone like the company's P20 series devices, but it does deliver a similar experience in many ways. Huawei launched its first P Smart device in South Africa last year, which became an immediate success and was the best-selling smartphone in its price range for 2018 according to GFK data. The P Smart 2019 is a refreshed version of this device, with better features, better specifications, and a new flagship design. To see just how much value the P Smart 2019 delivers to customers, we've compared it against another mid-range device from Samsung - the Galaxy A6+. 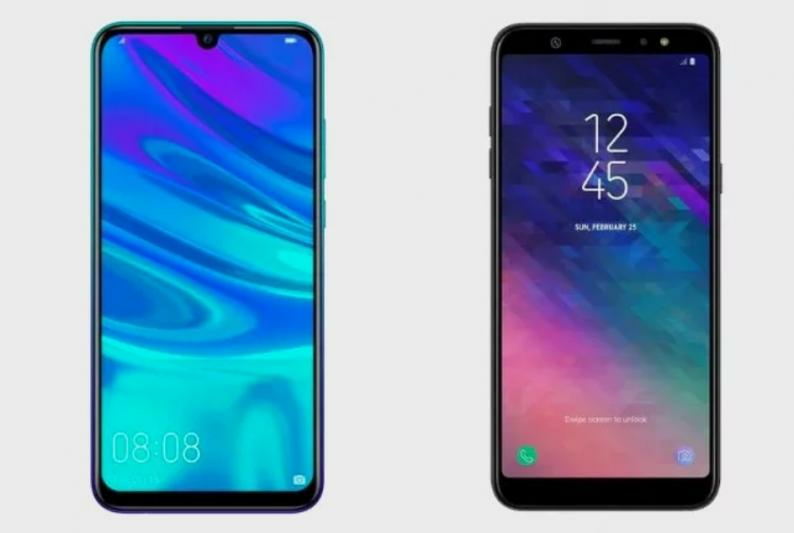 The Samsung Galaxy A6+ and the Huawei P Smart 2019 trade blows evenly on hardware in most specifications, but the P Smart 2019 has a major advantage over its opponent in storage space. Huawei's P Smart 2019 also ships out of the box with Android 9.0, making it a must-have for Android fans looking for a mid-range device. Conversely, Samsung has not yet rolled out Android 9.0 to all its current flagship smartphones. It should also be noted that the P Smart 2019 includes support for Huawei's GPU Turbo technology, making it a much better choice for mobile gamers due to its increased performance. 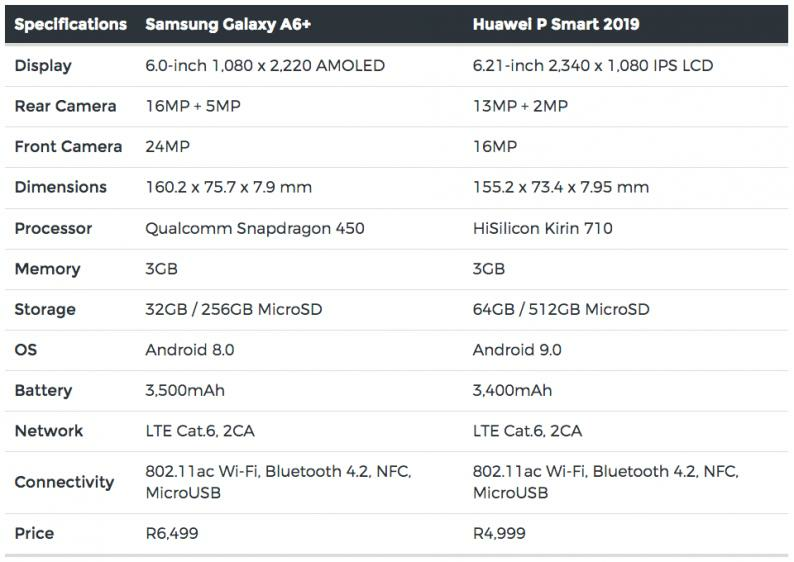 Both smartphones offer similar basic specifications, but the price difference is what makes the Huawei P Smart 2019 a great choice for mid-range smartphone buyers. Priced R1,500 less than the Samsung Galaxy A6+, the Huawei P Smart 2019 is a far more attractive option for the shopper on a budget. Below is a detailed breakdown of the specifications and recommended retail price of both smartphones. The design of these two smartphones differ dramatically. Samsung's Galaxy A6+ retains its standard, mid-range display aesthetic with the top bezel taking up a large portion of the display and housing the device's front-facing camera. The P Smart 2019 also includes flagship software features, such as object and scene recognition in addition to intelligent filter application and image processing. Most notably, the only bezel on the front of the P Smart 2019 is a small chin below the display and the tiny notch which houses its 16MP camera. This makes the smartphone look like a flagship device despite its relatively low price tag. Huawei has positioned its P Smart 2019 in the South African market to offer a beautiful design with great features at a price point more attractive than any of its competitors. This article was published in partnership with Huawei.